We got news yesterday that my daughter was accepted to her first choice University. It is a very exciting time in our house and we have a lot of planning to do for the next few months. My husband went out to the local grocery store and got her a lovely bouquet of flowers, a beautiful card and a few bunches of fresh broccoli. A very random purchase but I thought a fresh salad and BBQ would be the perfect way to celebrate my daughters recent accomplishments. She loves veggies and chicken so i put together this salad and my hubby got busy with the BBQ. This salad came together in 15 minutes. It made a lovely main dish but was a perfect accompaniment to the piping hot BBQ meal as well. 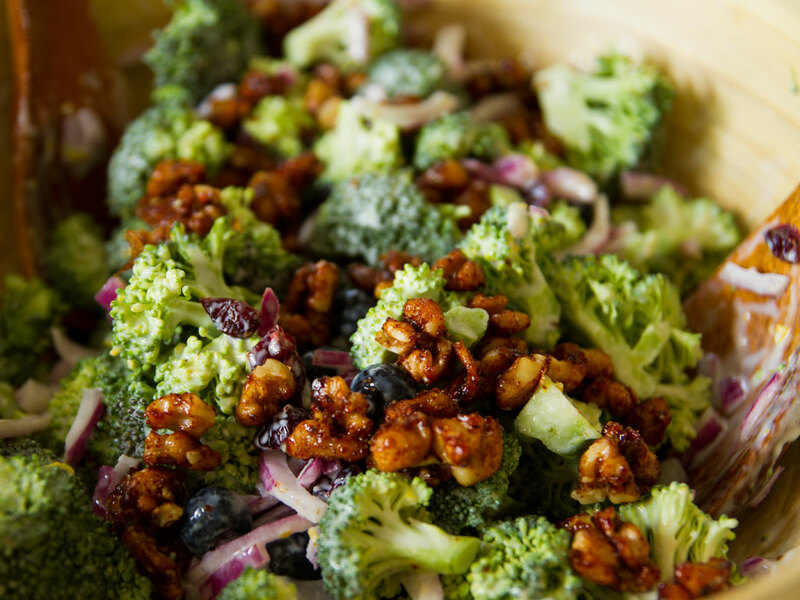 When preparing the salad, perhaps the trickiest part is toasting the walnuts. I would highly suggest that you keep a close eye on the walnuts as you toast them ad they will burn very easily. They will also cool fairly quickly and I learned this the hard way. Once they are cool they will stick hard and fast to the bottom of the pan so instead of smashing them up into little crumbs to remove from the pan I turned the heat to low and remelted them. I was then able to turn them out onto the parchment paper to cool again. I chose to only use the tops of the broccoli this time but feel free to use the stems as well. There are 10.4g net carbs and 3 Weight Watchers points per serving. To prepare the walnuts: Add all ingredients for the walnuts to a small pot and heat over medium. Cook 5 to 8 minutes until mixture is very bubbly and walnuts have caramelized and turned golden-brown. Be careful not to burn. Turn walnuts out on parchment paper to cool. (don't leave themin the pot as they will stick). Chop the walnuts when cool enough to handle. For the salad: Chop the broccoli crowns into small florets. Put the florets in a large serving bowl. In a small bowl, stir together the yogurt, lemon zest and juice, agave and salt. 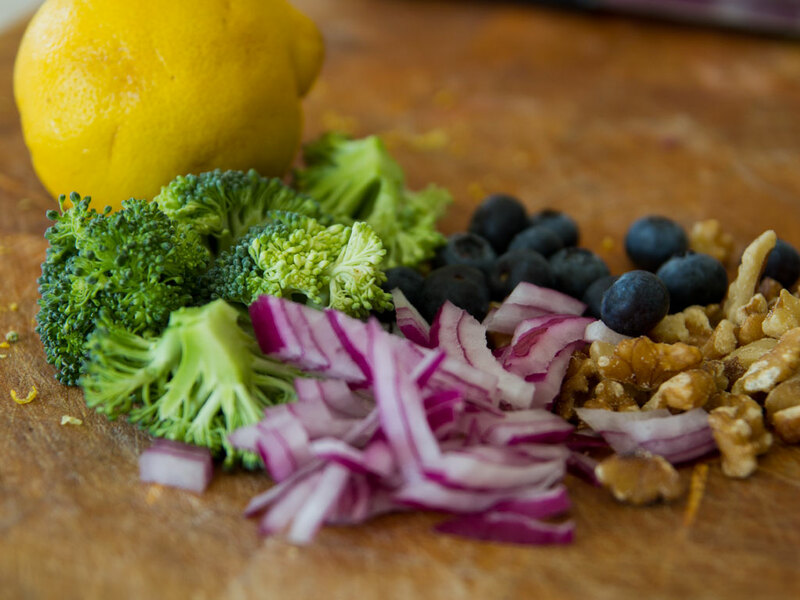 Pour this mixture over the broccoli and stir well to coat all of the broccoli with dressing. Add the red onion, blueberries, dried cranberries, and toasted walnuts. Toss everything together and serve.